NYC, 05/16/2019, 2:00PM. 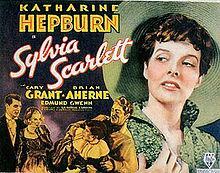 George Cukor's Sylvia Scarlett (1936): Romantic Comedy. A free-spirited young woman wants to run away with her con artist father to France, but needs to pretend to be a boy to do it. 95 min. Director: George Cukor. Stars: Katharine Hepburn, Cary Grant, Brian Aherne. Sylvia Scarlett was the first pairing of Grant and Hepburn, who later starred together in Bringing Up Baby (1938), Holiday (1938), and The Philadelphia Story (1940).